Around 1967 American blues musician Taj Mahal formed The Rising Suns with fellow blues-man guitarist Ry Cooder, playing at Whisky a Go Go, which gave Mahal the opportunity to play with blues legends, amongst them Howlin' Wolf, Muddy Waters and Buddy Guy. The Rising Suns only recorded one album (not released by Columbia Records until 25 years later) before Mahal went off to pursue his own career. After a couple of albums, and an appearance on the Rolling Stones Rock and Roll Circus, he secured his reputation with the Giant Step album in 1969. Taj Mahal has consistently made great records that combine his extensive knowledge of roots music with a refreshingly non-elitist sensibility. Giant Step/De Ole Folks At Home (released as a two-record set) from 1969 was Taj's high point, and it's easy to understand why. Together with the under appreciated guitarist Jesse Ed Davis, features Taj and band blending rock and blues on songs like "Take a Giant Step," "Give Your Woman What She Wants" and "Good Morning Little Schoolgirl." The second half is more laid-back and down-home, with Taj essaying solo renditions of "Fishing Blues," "Stagger Lee" and "Light Rain Blues" on harmonica and acoustic guitar. The most effortlessly enjoyable record of an effortlessly enjoyable career. 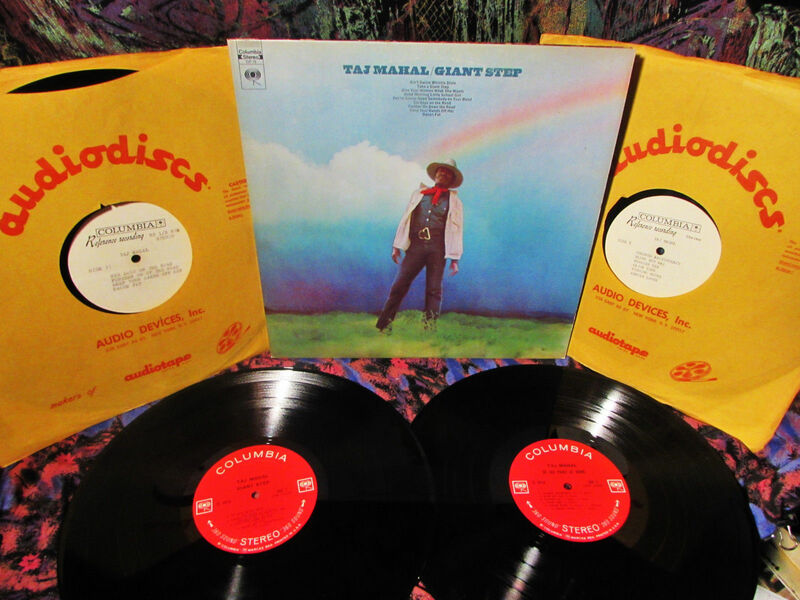 From the magical first song, "Ain't Gwine Whistle Dixie' to romps like "Six Days on the Road" and "Candy Man", and on to folk-blues gems like "Fishin' Blues" and the great "Take a Giant Step," Taj Majal keeps his focus, and shows us the inner soul of these songs. Throw in delicious instrumentals like "Colored Aristocracy" and you have a MUST listen album. An American legend: Taj Mahal together with the underrated guitarist Jesse Ed Davis. "You're Gonna Need Somebody on Your Bond"
"Keep Your Hands Off Her"
The DOUBLE (2xLP) TEST PRESSING IS M- as well .... 4 Lp's in all!! .. A cool addition to anyone's music library! SEE: SELLERS OTher items for similar cool sounds for "head" people... EFFICIENT/CAREFUL GRADING All imperfections are noted both cover & record NOTE: All Items backed by money back guarantee! IF you have a problem PLEASE let us solve for you BEFORE leaving ANY negative feedback. Thanks! GRADING SCALE: M, M-, EX, VG++,VG+, VG, VG- M Completely clean, no marks M- Carefully used, looks clean, plays clean, shiny gloss, no marks EX Faint scuff or superficial mark, near M-, high gloss, plays clean VG++ Glossy with minimal scuffing or light mark playing very nice, clean VG+ a bit more scuff or markls still plays well with very minimal surface at worse VG more marks/scratches only minor, nothing deep, no loud clicks or pops this grade is abused by many, VG here does not mean "trashed" VG- surface noise present, will not have skips or jumps ALL PAYMENTS SHOULD BE MADE WITHIN 5 DAYS Of AUCTIONS END BIDDERS PLEASE = Do Not Bid If You Are Not Serious About Following Through The Transaction! ALL ITEMS GUARANTEED FOR WINNING BID - LESS SHIPPING!